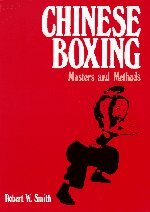 Chinese Boxing, Masters and Methods by Robert W. Smith. I bought this book on the recommendation of Greg in the 1970's. Robert W. Smith is an educated and articulate person who spent the early 1960's in South East Asia gathering and documenting information on Chinese Martial Arts. He brings a good background in Western philosophy and applies rational analysis to these traditional teachings, whose essence is often obscured by ritual and arcane symbology. Smith's main interest was in the "internal styles". Internal styles emphasise the development of "chi", a sort of "life force" which also figures in traditional models of acupuncture theory. By contrast "external styles" focus on development of muscular strength, meeting force with force. 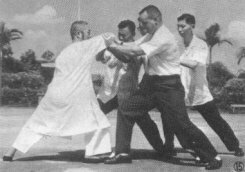 Smith was lucky (and persistent) enough to study with Cheng Man-Ching, the Grand Master of Tai Chi Chuan (Grand Ultimate Boxing). Tai Chi was particularly interesting to Greg because the postural conditions developed through its practice are very close to those in the Alexander technique... extended spine, floating arms ease of movement, coordination of the legs and waist with the upper body. Smith's descriptions of learning how to trust the "chi" reminded Greg of Alexander's exhortations to "inhibit" our usual responses. The descriptions of "touch" are fascinating and relate directly to the development of touch in the playing of piano. In the picture above you can see Cheng apparently thwarting the push of four men. Incredible as this may seem to Western eyes... I have experienced Greg doing the very same thing. Whether these displays of strength are due to the cultivation of chi or a particular psycho-physical state is a moot point in my opinion. The point is that they demonstrate that "trying" in the way many in our culture are accustomed to is not the best way to achieve speed, accuracy and coordination.